Think back to last year, when the Golden Knights traveled up to San Jose for Games 3 and 4 of the second round series with the Sharks. 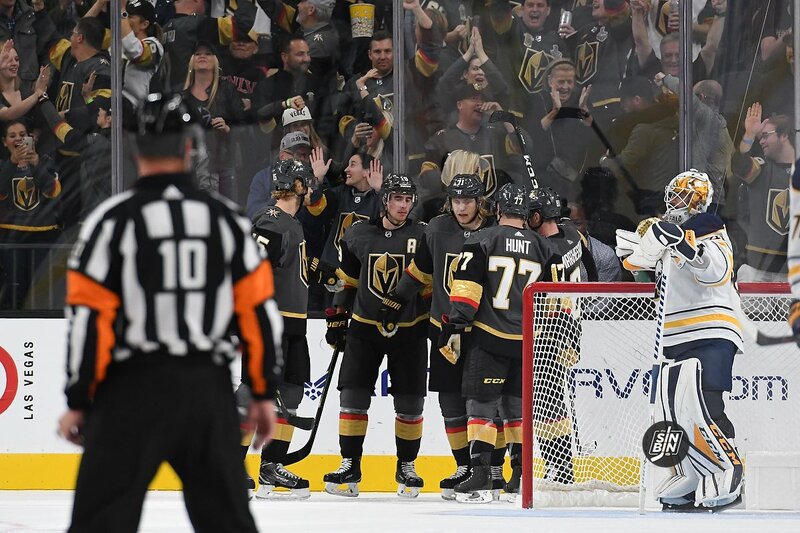 After a wild Game 2 in which Vegas had their game-winning goal wiped off the board, the series was tied 1-1. The Golden Knights took a two-goal lead into the locker room for the second intermission. 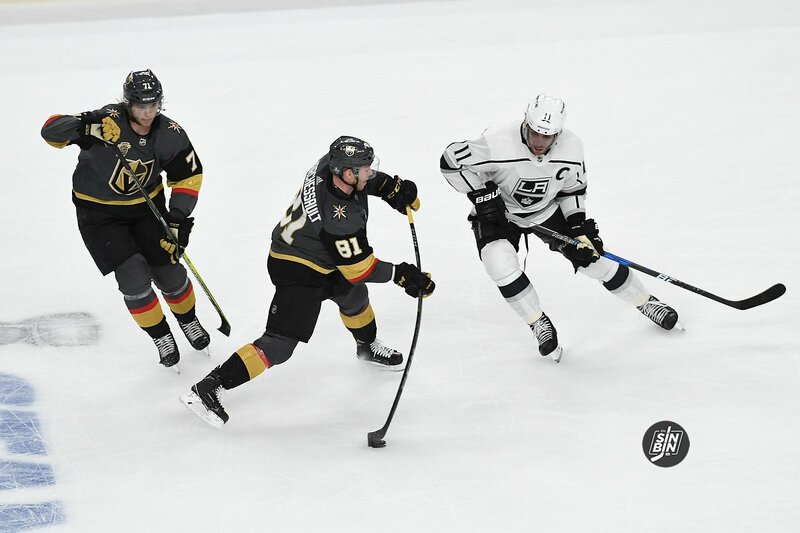 Then, all hell broke loose and the Sharks scored not one but two goals to tie up the game and send the pivotal Game 3 into overtime. 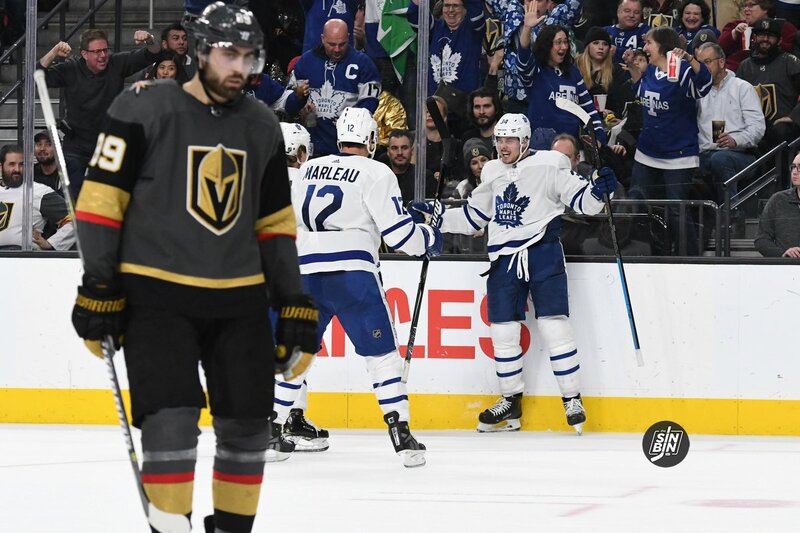 On that night, a loss in San Jose could have devastated the Golden Knights chances to continue their magical inaugural season. Luckily, William Karlsson was there to save the day, scoring a game-winner on a gorgeous shot past Martin Jones. Now, fast forward 348 days to Game 2 in San Jose. 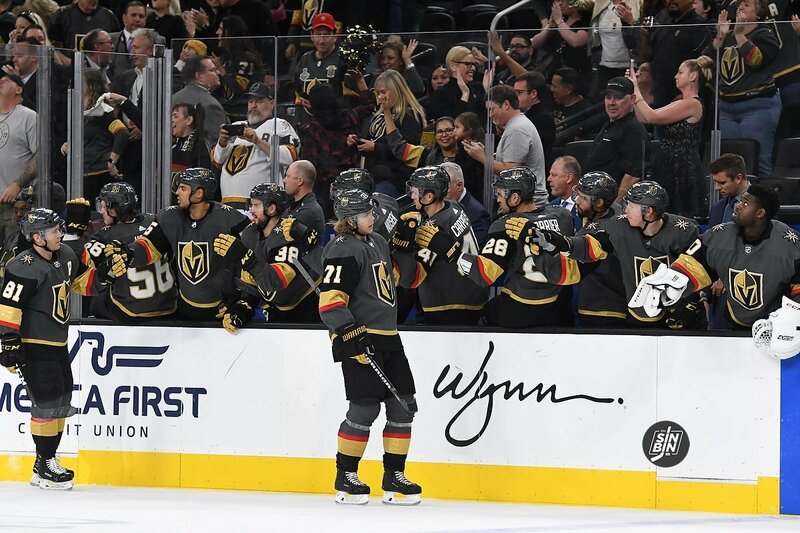 Once again, the Golden Knights are in danger of watching their season slip away unless they can salvage a road game at the SAP Center. They had amassed a three-goal lead and blew it inside of the 1st period. They allowed a goal that was eventually waved off. 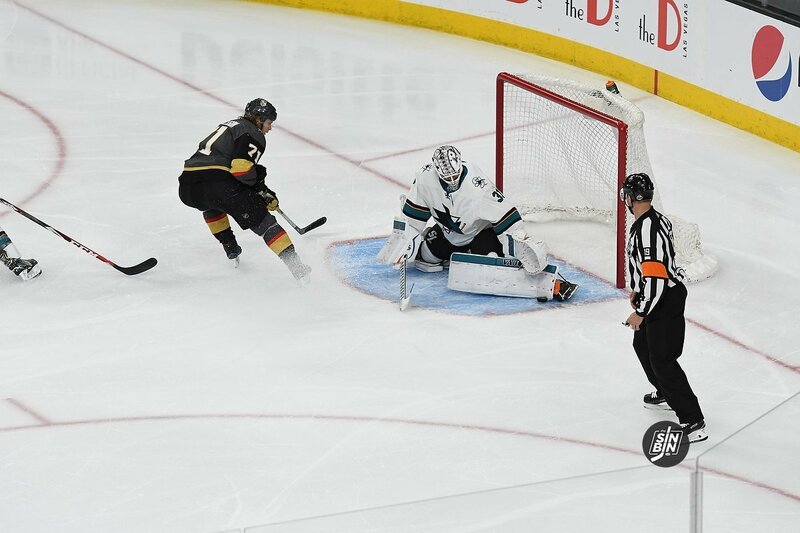 And heading into the 3rd they had successfully killed five of six penalties, but a seventh one early in the final frame looked like it could have been the one to help San Jose tie a 4-3 game. The first minute of the power play the Sharks looked dangerous including shots from Brent Burns and Logan Couture and an Erik Karlsson shot that was blocked. After a few clearances, the Sharks finally got set up perfectly in the zone, with Brent Burns on one point, Erik Karlsson on the other, and Joe Pavelski screening Fleury. The puck went from Burns to Karlsson, back to Burns, to Karlsson, to Burns, to Karlsson, back to Burns, and then on to the stick of Joe Thornton who was walking in towards Fleury. Thornton tried to slide one towards Joe Pavelski and Tomas Hertl in front of Fleury, but the shot pass was blocked by Schmidt. From there, I’ll let the man who ended up turning the game on its head, William Karlsson, take over. The pass was fired diagonally in between the two bearded beasts. It had some heat on it, but Karlsson caught it in stride heading in on a 1-on-none breakaway. 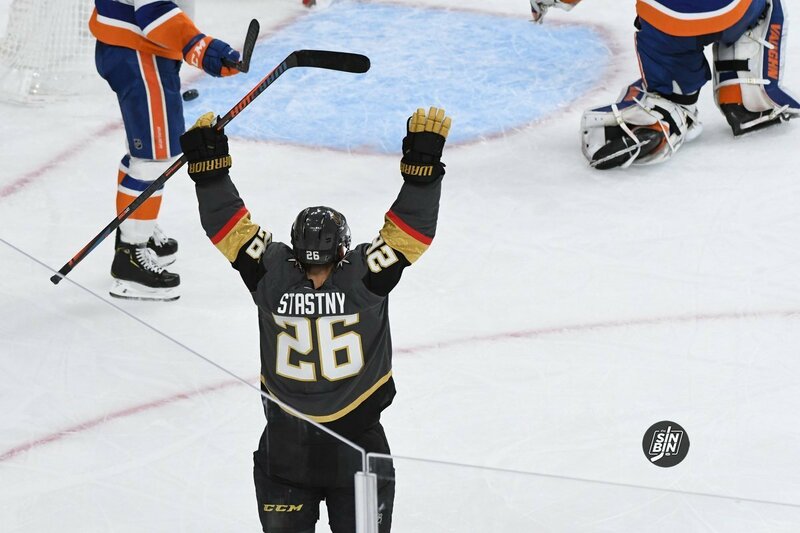 As the dust settles on the Mark Stone trade, it’s time to start looking at the future of the Vegas Golden Knights as it relates to the salary cap. The salary cap was set at $79,500,000 this season. The normal increase in salary cap from year to year is about 2-5%. Last season the cap increased by $4.5M. It should be expected that the cap increase from this season to next will be in the neighborhood of $4M to $7M. Thus, we can expect the salary cap to be somewhere around $85,000,000. According to CapFriendly.com, the best salary cap site on the Internet, the Golden Knights projected cap hit for 2019-20 is $72,875,000 without Stone’s imminent $9.5M AAV extension. So, just with Stone, the Golden Knights are looking at a projected cap hit of just under $82,375,000. The Golden Knights still have David Clarkson on the roster. His contract can be placed on long-term injured reserve (LTIR) next season. There are some oddities to that rule, but for simplification sake, Vegas can get around $5.25M in salary cap relief by making this move. Therefore, if nothing changes, Vegas should have around $7,875,000 left to work with. I grew in the era of high-profile, wealthy athletes proudly stating “I am not a role model” to their young fans. For those of you that don’t remember, NBA legend Charles Barkley starred in a semi-controversial Nike ad in the 90’s. While the message by Barkley was actually quite important, kids like myself had no clue what Sir Charles was expressing. We just assumed he didn’t care about us or the game and was only in it for the money. But times have changed since Barkley played. Social media and other outlets have made it easier for players to interact with fans. Some grasp it, and some don’t, but either way, players have much more access getting their message out to fans. 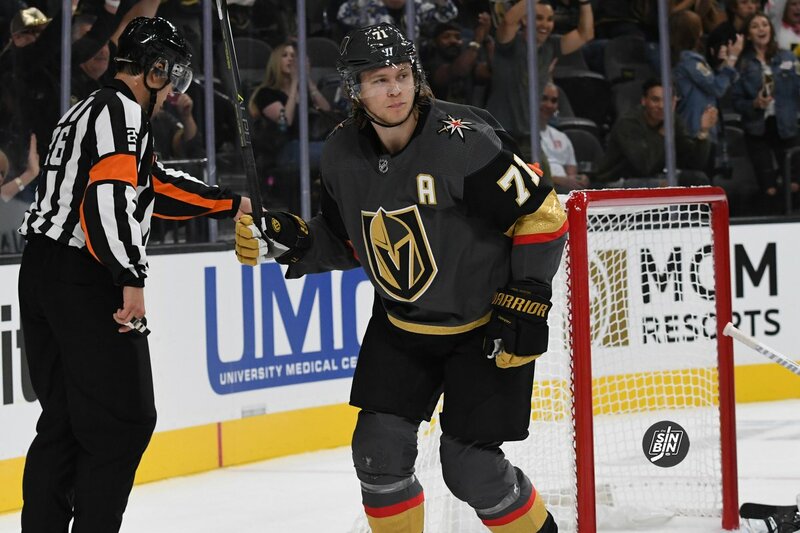 One guy that understands the responsibility of being a local role model is Golden Knights center, William Karlsson. Karlsson and I chatted a few weeks back about striving to become a good example for kids on and off the ice. In his point of view, it’s critical for the 26-year center to represent himself and the city of Las Vegas with class. At this point last year, William Karlsson had 7 points (3 goals, 4 assists) and was on pace for 52 points. He ended up with 78, averaging 0.95 points per game. This season, Karlsson has 9 points (3 goals, 6 assists) through 11 games, scoring 0.82 points per game. At this rate, he’s projected to reach 68 points, 17 points ahead of last year’s pace less than a month into the season but 10 short of his final tally. Karlsson confidently assured fans not to be concerned about the team’s lack of scoring, as long as his line generates scoring chances. Something the Golden Knights top line does game in, and game out. Could they have more goals? Sure, but the entire team should as well. The top trio has 25 combined points and the rest of the team has 32 total points. Can the top line do it alone? The Golden Knights are 5-3-0 this season when their top line scores. 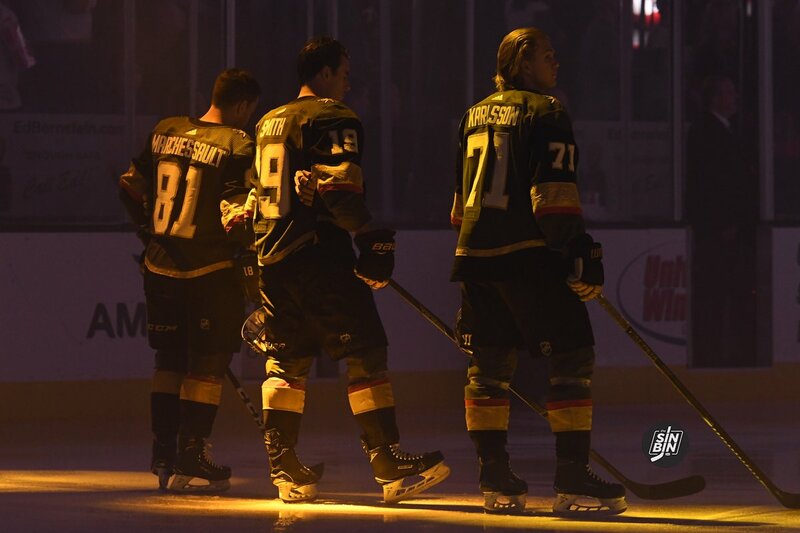 Last season, Vegas’ record was 46-15-4 when Jonathan Marchessault, Reilly Smith or Karlsson registered a point. Looking back, it feels like the top three did do it all. 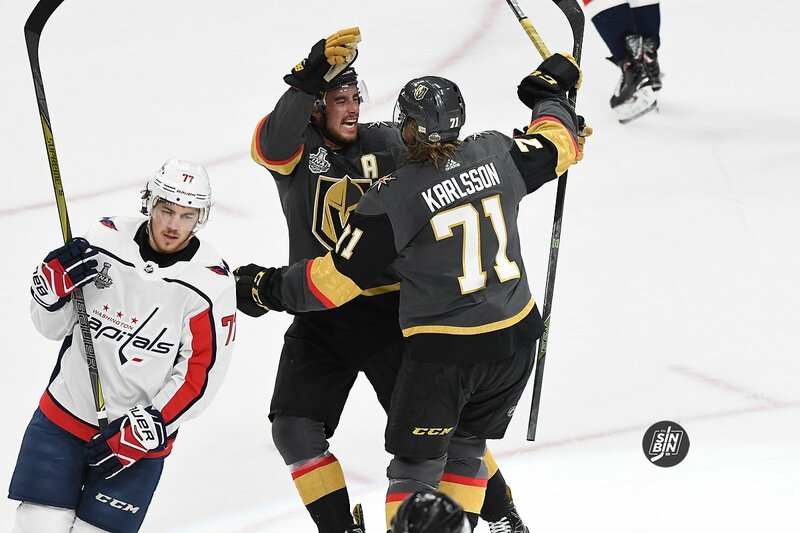 In 2017-18, Karlsson, Marchessault, and Smith combined for 16 game-winning goals and recorded 213 of the 711 Golden Knights points. 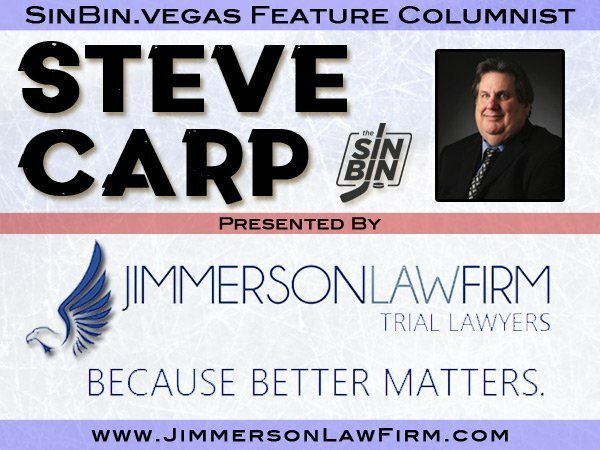 Just like the star Swede, Vegas’ coaching staff isn’t concerned about top lines production but would like more scoring balance throughout the lineup. The buzzword around the locker room is execution. Players are aware 2.27 goals scored per game isn’t enough to have success in the NHL. Thankfully, the team can heavily rely on one of the best lines in hockey. Pretty sure the top line won’t mind. I think I can hear Marchessault tapping his stick for the biscuit right now.